Excerpts from today's issue of Aussie Marxist-Leninist paper Green Left Weekly. Article by Omar Hamed of Aotearoa Radical Youth. 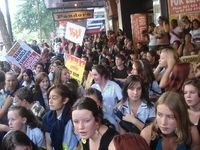 On March 20 in the heart of Auckland’s central business district, 1000 high school students who had walked out of school that morning rallied to demand an end to youth rates. The students were demonstrating the power of collective direct action, using their feet to vote for the Green Party-initiated Minimum Wage Amendment Bill, which would scrap youth rates for 16- and 17-year-olds. The action was called by Aotearoa Radical Youth, a network of anti-capitalist Auckland students and young people that was established last year by myself and two other high school students to provide a means of challenging the injustice in our world. A representative from each school spoke briefly about their experiences with youth rates and how they feel sick and tired of being exploited and discriminated against because of their age. After the rally, the thousand students marched down Queen Street, making small forays into multinational fast-food outlets to bring the fury of the streets back in the faces of the managers and politicians. The day was a good step for the campaign against youth wage discrimination and a good day was had by all, except those who suffered brutal police behaviour directed at marchers. A brief scuffle with police got me arrested after I attempted to slow a speeding ambulance that I felt was endangering the safety of young people who had seated themselves in the middle of an intersection. Some schools tried to stop students from walking out. At Takapuna Grammar — my old school, and the only school that had some idea of who Radical Youth are, because I threatened to take the school to the Human Rights Commission last year for censoring anarchist websites — 500 students were about to go on strike when the principal promised in an impromptu assembly, “If you do not walk out today, I will take three of you to Wellington with me next Monday and we will approach parliament to take up the issue”. The students did not end up going on strike, so it is expected that three students including the Radical Youth member at Takapuna, will be flying to Wellington to talk to parliament about the issue. This was a result of the action these students were about to take. We know that this trip will add clarity to the unified voices of all the students who walked out. Nista Singh, a Radical Youth spokesperson during the walkouts and former Pizza Hut worker who went on strike last December with Unite against the World Trade Organisation and exploitation of migrant labour, is receiving a commendation from her principal at Mount Roskill Grammar for her work on the Supersizemypay.com campaign. The walkout looks to be paying off, with the Unite union announcing today that McDonald’s is looking at phasing out youth rates, something the union says the company was not going to do before the walkout. As youth win over public support for an end to discrimination, more young people are standing up and fighting back against injustice. We are young, we are angry and we are poor. And as the recent insurgency in France shows us, “We are everywhere”. It seems that this lot will have promising careers as lifelong student politicians! Trouble and not a clue in the world!